It’s been a long while….not to say that there haven’t been numerous yarn crimes committed; I’ve just gotten away from detailing them. But…I just couldn’t let this one pass by. Lion Brand Free patterns is the source for many yarn crimes – and they continue to disappoint/live up to their rep. And of course one is always walking on the very edge of the cliff with pom-poms for people older than 7 or 8…. Still, on some level I am pleased that several people actually got paid for this – the designer, the test knitter, the tech editor, the website flunky, the model, the photographer and the stylist (really? pink dotted hose? at first I thought the model had some kind of skin condition). I mean if all of these people have jobs related to this dreck, the economy must not be as bad off as I imagined. * Happy St. Patrick’s Day to you and yours. Now go eat some potatoes and cabbage. Scraping the bottom of the clip art barrel…. While I was wasting my time/honing my skills/avoiding housework this afternoon with the nearly-incapacitatingly-addictive “Bejeweled Blitz” game on Facebook: one minute of seeking to match brightly colored objects as fast a you can – it’s only a minute so why not play again? And Again? And then 3 hours later….. I mean….how is this picture appropriate for the headline of the AD? Is the guy supposed to be a college student? What’s with the facial hair? Is this yer average scholarship recipient? 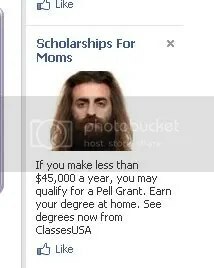 Or maybe he’s the guy who wrote the AD and wanted a little recognition of his similarity to George Carlin 40 years ago? Or maybe of his hirsute-y goodness? The mind boggles….I would of course love to see your ideas for captions et al, dear readers (all 5.4 of you! ).